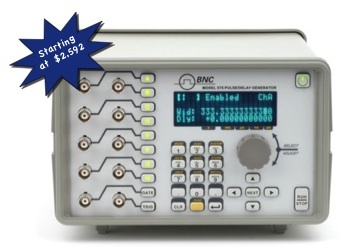 The Berkeley Nucleonics 6040 pulse generator provides superior performance characteristics. For example, the timing accuracies of 0.01% for frequency and 0.2% for delay and width are unusual for a pulse generator. The triggering jitter of 25 ps provides synchronizing capabilities usually associated with only the very best digital delay systems. Plug-in modules let you select the output configuration you currently need. The Model 6040 pulse generator provides superior performance characteristics. For example, the timing accuracies of 0.01% for frequency and 0.2% for delay and width are unusual for a pulse generator. The triggering jitter of 25 ps provides synchronizing capabilities usually associated with only the very best digital delay systems. Plug-in modules let you select the output configuration you currently need. Even the mainframe 6040 without any module provides capable positive and negative outputs. Capabilities of the mainframe with its modules include: single pulse, double pulse, impulse, external drive, external modulation and CW. The modules themselves determine which of these capabilities are available. Some modules can operate to full repetition rate of the mainframe; others are limited to a smaller number.